Bill and Sara Connell were having trouble getting pregnant. After a round of in vitro fertilization, Mrs. Connell gave birth to stillborn twins, and later had another miscarriage. It’s sad to see anyone go through these kind of problems, especially when they really want children. However, the Connells had an ace in the hole: Sara’s mother, Kristine Casey. Mrs. Casey has three daughters, and as such has proven she can carry a child, and she volunteered her womb for the birth. 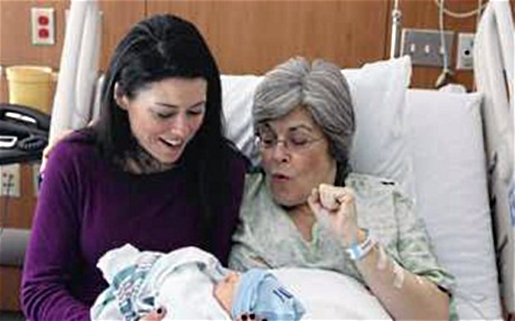 A 61-year-old woman named Kristine Casey gave birth to her own grandson in Chicago, Illinois. “The three of the happiest days of my life were giving birth to my daughters, and I thought I could choose to do this for someone I love,” said Mrs. Casey, the oldest woman to give birth in the state of Illinois. Amazingly, both grandmother and grandson are fine. The baby, Finnean Connell, was born healthy and full-term at 39 weeks gestation. The child was born via C-section. Ms. Casey had to pass a battery of mental and physical tests to prove she was capable of being a surrogate parent. Amazingly enough, she’s now the mother of her own grandson.